There are a number of different paths for a person to take in order to become a Worship Pastor. Within many churches, opportunities to become a part of the clergy or ministry include senior pastor, evangelist, teacher, chaplain, and many different associate pastor roles that lead specific areas of the church. One of those associate pastor roles that is integral to the leadership and membership of a church is the Worship Pastor. To begin to gain the knowledge and skill set necessary to effectively become a part of the ministry in a Worship Pastor position, it is important to understand all that might be required in this role. Although the specific role of a Worship Pastor will change depending on the denomination and individual church, there are some common responsibilities. Of all the responsibilities a Worship Pastor will undertake, musical leader is the most important task. A Worship Pastor is often the coordinator of the homily and musical portions of weekly worship services, in addition to directing the choir and instrumentalists of the church. Additionally, a Worship Pastor is likely to play a large role in any productions or performances the church may present, including those for religious holidays. Overall, having musical talent and training in direction, program coordination, and musical concepts are essential skills to have to become a worship pastor. Additional information can be found at the National Association of Pastoral Musicians website. Music is often used as a learning tool in all types of environments, and the church also takes advantage of the expertise of a Worship Pastor to work with the children of the church, teaching biblical stories and ideas to children through music. Therefore, having the desire to work with children and the ability to teach are important qualities for future Worship Pastors to have. 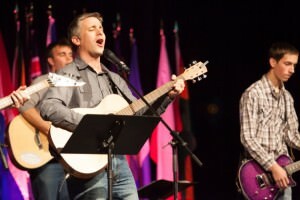 In addition to the contributions a Worship Pastor will make in leading through the use of song and instruments, there are a number of tasks that require skills in general ministry as well. The worship pastor will work closely with a congregation as a counselor for spiritual and emotional needs, as an orator of sermons and lessons throughout the church, and as a religious guide. A worship pastor must be empathetic, rational, open-minded, and undertanding, using those qualities in combination with skills in teaching, listening, advising, public speaking, and analysis. As with the individual responsibilities of this leadership position in the church, what type of education that is required varies by the needs of an individual sanctuary and denomination. In many cases, however, a church will prefer or require for all pastors to have a minimum of a bachelor’s degree in a theological discipline. Degree options at the undergraduate level include Biblical studies, theology, ministry, and divinity. Course work in these programs is likely to include religious text study methods, religious history, religious counseling, religious leadership, and principles of teaching. Worhsip Pastors also benefit from undergraduate degrees or minor course work in music. Ultimately, to become a Worship Pastor, a religious organization will look to individuals who are passionate about faith, music, and serving the members of a congregation.